Sikkim University Recruitment 2019: Sikkim University, Gangtok / www.cus.ac.in is conducting recruitment processes to fill 8 vacancies. As of now, there are four recruitment drives going on for Project Assistant Post, Junior Research Fellow & Project Assistant Posts and others. Sikkim University Recruitment 2019 - Walk in for Project Assistant Post on a project entitled "Farming system based assessment of pollinator, Soil Macrofauna, and local crop germplasms under the different agro-ecological situation in Sikkim" in Sikkim University, Gangtok, Sikkim. Candidates are invited by Sikkim University, Gangtok to attend walk-in-interview to be held on 30 Apr 2019 at 11:00 AM for 1 vacancy. Sikkim University Recruitment 2019 - Walk in for Junior Research Fellow & Project Assistant Posts on a project entitled “Conservation, Promotion and Intensification of local crop landraces or germplasm for livelihoods of organic farmers in Sikkim,” in Sikkim University, Gangtok, West Bengal. Candidates are invited by Sikkim University, Gangtok to attend walk-in-interview to be held on 29 Apr 2019 11:00 AM for 3 vacancies. Sikkim University Recruitment 2019 - Job notification for Library Trainee Post in Sikkim University, Gangtok, Sikkim. Applications are invited by Sikkim University, Gangtok on or before 22 Apr 2019 for 1 vacancy. Sikkim University Recruitment 2019 - Job notification for JRF Post on a project entitled “Large Scale Biological Network Reconstruction and Analysis for Identifying Therapeutic Targets for Alzheimer’s: A Big Data Initiative” in Department of Computer Applications, Sikkim University, Sikkim on Temporary on Co-terminus Basis. Applications are invited by Sikkim University, Gangtok on or before 21 Apr 2019 for 3 vacancies. Sikkim University Recruitment 2019 - Job notification for JRF & FA Posts on a project entitled “Ecology, distribution and phylogeny of Takydromus sikkimensis (Günther, 1888) (Squamata: Lacertidae) in the North East India” in Department of Zoology, Sikkim University, Sikkim on Temporary on Co-terminus Basis. Applications are invited by Sikkim University, Gangtok on or before 23 Mar 2019 for 2 vacancies. Sikkim University Recruitment 2019 - Job notification for JRF & FA Posts on a project entitled “Diversity pattern, range size distribution and trait composition of butterflies along elevation gradients in the Sikkim Himalaya” in Department of Zoology, Sikkim University, Sikkim. Applications are invited by Sikkim University, Gangtok on or before 27 Feb 2019 for 2 vacancies. Sikkim University Recruitment 2019 - Walk in for 17 Guest Faculty Posts in Sikkim University, Sikkim. Candidates are invited by Sikkim University, Gangtok to attend walk-in-interview to be held on 13 Feb 2019 for 17 vacancies. Sikkim University Recruitment 2019 - Job notification for JRF Post on a project entitled “Development of Bio-compatible Fluorescent Quantum dots Emitting in Second Near Infrared Region (1000-14000 nm)" in Department of Chemistry, Sikkim University, Sikkim on Temporary Basis. Applications are invited by Sikkim University, Gangtok on or before 15 Feb 2019 for 1 vacancy. Sikkim University Recruitment 2019 - Walk in for JRF Posts on a project entitled “Farming system based assessment of pollinator, Soil Macrofauna, and local crop germplasms under different agro ecological situation in Sikkim” in Forest, Environment and Wild Life Department, Sikkim University, Sikkim. Candidates are invited by Sikkim University, Gangtok to attend walk-in-interview to be held on 06 Feb 2019 at 11:00 AM for 2 vacancies. Sikkim University Recruitment 2018 - Walk in for JRF Post on a project entitled “Study on the effect of Long-Term Excessive Zn Supplementation on Gene Expression of antioxidant enzymes in Wistar rats and their F1- generation rats. 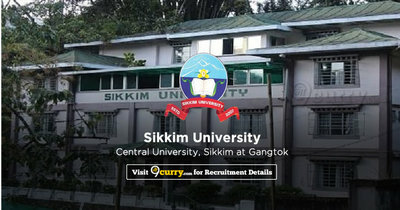 in Sikkim University, Gangtok, Sikkim on a Temporary Basis. Candidates are invited by Sikkim University to attend walk-in-interview to be held on 04 Feb 2019 11:00 AM for 1 vacancy.